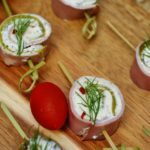 Ham & Dill Rollups with Cream Cheese done pinwheel style with a little red pepper kick are the perfect appetizers for game day, tailgates, the Super Bowl, even after school! Mix pickle juice, crushed red pepper and black pepper with cream cheese. Spread a thin layer of cream cheese over each ham slice. Top with 2 pickle slices, side by side. Using a knife, cut the ham on down each side of the pickle slices to separate the pickles from the rest of the ham and each other. Discard extra ham. You should be left with 6 ham, cream cheese, and pickle slice stacked strips. Cut each of the 6 ham, cheese, pickle strips down the middle lengthwise to create 12 long strips to roll up. Roll up each strip to create a pinwheel and use a bamboo skewer to hold in place. Pat the pickle slices dry before stacking them on top of the cream cheese and ham. This makes sure everything doesn't get too wet & messy. Cut the pickles 1/4-1/2 inches shorter than the ham slices, so that the end of the pinwheel is just ham and cream cheese. This is easier and neater to close up. Go slow and easy while you're rolling up your pinwheels. You may have to stop mid way and tuck everything back in. That's ok! Don't worry about cream cheese out squeezing out when rolling everything up. Just tuck it back in when you are finished. You may have to grab a little cream cheese on the end of a butter knife and spread it over the top of your pinwheel, gently pressing down to fill any spaces where the cream cheese was squeezed out during the rolling process. Keep a paper towel or kitchen towel handy to keep your hands clean and to clean up your work space after rolling each pinwheel.